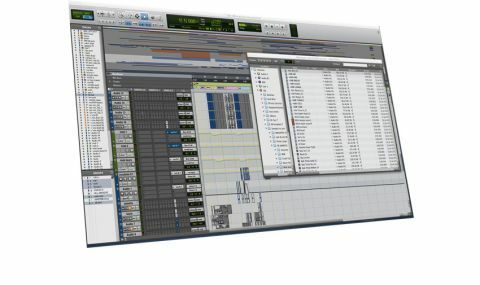 Pro Tools 11 now delivers all you should expect of the true industry standard pro DAW. 64-bit architecture. Offline bounce. Intelligent CPU management. Not much - as we said, we've yet to make it fall over. All Pro Tools users, even the reluctant, cynical and disgruntled, will have felt a little of the excitement shown in the early PT11 promo films when the big news finally came. We wonder if the grown men in that video, grinning like idiots, high-fiving and punching the air were not so much reacting to the stunningness and innovation in what they were seeing, but more out of relief that the only DAW you can really use for high-end audio work had finally come through with what they actually needed. "[Until now] the burning question was not 'shall we upgrade?' but rather 'can we upgrade?'" Once upon a time Pro Tools 5 had its own hardware and was the go-to software/hardware combo for serious digital recording. It never crashed, and behaved like a multitrack tape recorder in terms of input monitoring latency at a time when computer hardware was at the frustrating beginnings of its exponential evolution. Since then, to cut a long story short, it's been a bumpy, complicated and often costly ride for loyal customers, and the burning question is not 'shall we upgrade?' but rather 'can we upgrade?'. If you're in certain parts of the industry it's vital you can go back to old work, so it was hard enough losing certain TDM plug-ins if you wanted to move over to a Native version of Pro Tools a while back. Now we're losing a load of hardware support and moving over to the new AAX plugs, and with 32-bit and 64-bit versions of these it's a little confusing. Figuring out the cost is tricky too; weighing up the pros and cons of upgrades/crossgrades/software amnesties and hardware exchanges can take literally days, hundreds of diagrams and the permanent loss of vital brain cells! So, heated arguments about Avid's business models aside, let's assume we're going to make the leap. What lies ahead? Avid has understood the need to manage this transition. It's going to be a while before all your favourite toys are available as 64-bit AAX, so you can run PT10.3.6 and PT11.0.1 side by side on the same machine. Installing v11 will NOT overwrite v10. Installing the v10 upgrade keeps everything where it is. Installing v11 is done by dragging the icon into the App folder alias. So v10 remains where it always was, and v11 lives at the top level of your Apps folder. Once you've installed the v11 HD drivers you're good to go. Your 'pre 11' RTAS, TDM and 32-bit AAX plugs are loaded from the Digidesign and Avid folders respectively, and apart from the odd request from PT11 to move unsuitable 32-bit AAX plugs into the unused folder, all runs very well. All the big software players including UAD and Waves have pledged support, and are mostly in final stage beta for AAX native. Some developers including McDSP and VSL have already delivered 64-bit AAX versions, both Native and DSP - thanks guys! As you've noticed there are more abbreviations here than a military radio message, but it's probably a good idea to define Native and HD in terms of the software. The PT11HD version of the software is what you get when you buy an HD Native or HDX card based system, and has more tracks, busses, editing options, utilities, and so on. The Native version, simply PT11, comes as software only for use with non Pro Tools HD hardware, but up until now has been un-lockable, thus enabling PTHD's capabilities by buying the costly Complete Production Tool Kit (CPTK). This is no longer the case with PT11 where you can now pay for an upgrade to PT11HD. Some very basic features are disabled in the non-HD versions, for example channel input monitoring. This makes many customers very angry. "It's a new build from fresh, clean code, and claims to extract more power from your hardware"
Once you've done a Pro Tools install you usually sort out your I/O settings, and configure your CPU usage, buffer sizes and so on. But when you open the playback engine and System Usage windows you immediately know you're not in Kansas anymore. All this adds up to a stinkingly powerful system. A PT10 session that was close to maxing out the computer and thoroughly unstable opens without fuss in 11, with CPU, DSP and RAM headroom for miles. Big smiley face. Apart from minor cosmetic changes the Pro Tools look is the same, but the most obvious improvement is the 30% longer meters in the Mix window. This is just the tip of the metering iceberg though as there are now some Pro options for HD users. Both Native and HD users will find a new metering pane in the Preferences menu. Native users can now choose between the new default Sample Peak, Pro Tools Classic, Venue Peak and Venue RMS meter types. HD users have 17 new, highly configurable options including various VU, PPM and K-scale meters, and even gain-reduction meters that can show you the aggregate gain reduction of several compressors in a chain! All 11 users can now see output meters in the expanded send views (all ten at once if you like! ), so you can actually see where that surprise reverb is coming from! And you can hide your Mix window faders completely if you're using a control surface - makes sense doesn't it? Have a look at the Pro Tools 11: Top 5 New Additions below to see the really big changes. We could have done a top 20 as there are so many improvements, big and small, that it's hard to know where to begin. There are many little workflow enhancements. New key commands enable you to bypass multiple plug-ins, by row, in chunks or even by type! Power users can now create different track types and choose track bounce options with a click or two. "It's like driving a very expensive high-performance car. Very tight and responsive"
Well, we laughed like a maniacal villain as we overdubbed a vocal into a session with a system latency of over 9000 samples, and reduced our audio buffer to 64 and inserted an EQIII, a McDSP 4030 compressor and a McDSP MC404 multiband compressor on our voice as we were recording. Awesome. PT11 not only performs, but it feels great. It's like driving a very expensive high-performance car. Very tight and responsive. We haven't made it fall over yet. We'll have to see how it fares with a bunch of LL16s sucking on its jugular... but we expect it to briefly raise a quizzical eyebrow like Spock, and calmly carry on about its business. The thing with 11 is you soon get very used to it. Going back to 10 to print out some stems already feels entirely tedious. So get a move on Waves and UAD and Soundtoys and the rest of you. We've got a new stealth fighter here and we want to arm it. Finally we can do superfast offline bounces of outputs and busses. Right-clicking the output of a mixer track brings up a bunch of new options (where you can also select the other tracks which share outputs or buss assignments) and from the Bounce dialogue you can choose to import the newly bounced back into the session like a track freeze. Automation in PT11 is now time-stamped and sample accurate. This means that every bounce you make, whether real-time or offline is identical, which is not the case in previous versions. There's also a simultaneous bounce to MP3 option - something that will save PT users days. The new audio engine is lean mean, and super efficient. The CPU only unleashes power when and where it's needed. Now you can put a load of your best effects on a load of chorus backing vocals, and the CPU meters will only ramp up to deal with them at that point. In the past the CPU meter went up as you added plug-ins. Not any more. The implications of this are great in particular for console emulation plug-ins where there might be super CPU hungry options you could never use on a big session without maxing out. Well now you can. Even though it looks like the same old 'Tools' it's not. The application has been re-written without a backward glance at 32-bit environments. The obvious reason to get excited here is the availability of all that lovely memory. PT11 is not limited to around 3GB of Ram any more. We have 16GB in our Mac and Pro Tools can use all of it. This is great news for composers who need an orchestra of virtual instruments. We've already opened more Vienna Pro Instruments than we could have dreamed of in PT10, and a ton of AIR Mini Grands. Freedom at last! Another huge deal for PT users is the addition of a second audio buffer. The new Avid Audio Engine automatically manages playback buffer sizes during normal playback. The second you put an audio or instrument track into record or input the second buffer, which you set in the Playback Engine window, comes into play. Your input signal buffer can be at 64 samples, while the rest of the mix, complete with posh limiters etc, can be using a buffer as big as 2048 samples. This means you can overdub into a session with up to 16,000 samples latency, and monitor your input through plug-ins with little or none. In the Operation tab of the Preferences window is a new option 'Enable Automation in Record'. Previously enabling input or record on a track temporarily disabled any automation, but now you can record automation while you record audio. This is great if you are recording a real synth part with a plug-in filter for example. You can perform the filter moves while you're recording the synth and not have to try and recreate the moment afterwards. Live engineers using Avid gear to mix can record all their fader moves during the show along with the recorded audio. This gives a huge head start to the mixing process.